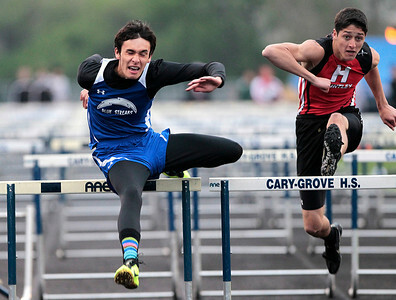 Kyle Grillot - kgrillot@shawmedia.com Woodstock senior Tyler Parsons competes with Huntley sophomore Brennan Bell during the final men's 110-meter high hurdles event of the Fox Valley Conference boys track meet Friday at Cary-Grove High School. 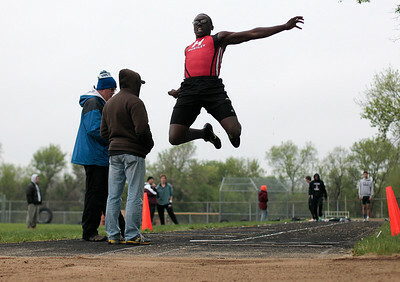 Kyle Grillot - kgrillot@shawmedia.com Huntley freshman Tim McCloyn competes in the long jump event during the Fox Valley Conference boys track meet Friday at Cary-Grove High School. 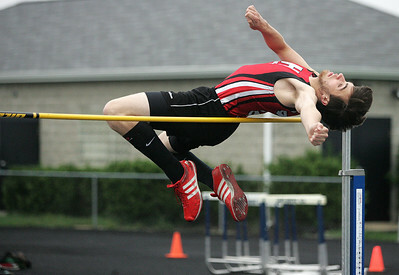 Kyle Grillot - kgrillot@shawmedia.com Huntley junior seth Raymer competes in the high jump final event during the Fox Valley Conference boys track meet Friday at Cary-Grove High School. Kyle Grillot - kgrillot@shawmedia.com Crystal Lake Central senior Isaiah Mosher screams into his hands after taking second in the men's 100-meter dash final during the Fox Valley Conference boys track Friday at Cary-Grove High School. 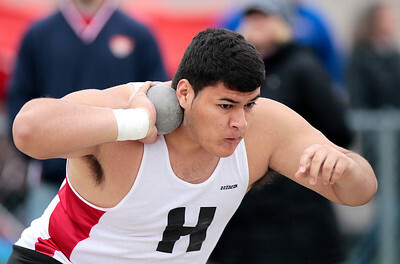 Kyle Grillot - kgrillot@shawmedia.com Huntley senior Isaac Jimenez competes in the shot put event during the Fox Valley Conference boys track meet Friday at Cary-Grove High School. 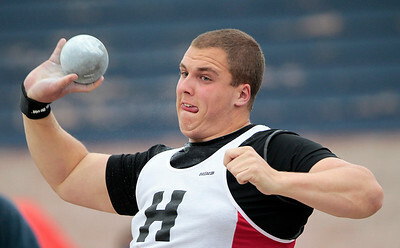 Kyle Grillot - kgrillot@shawmedia.com Huntley senior Justin Herbert competes in the shot put event during the Fox Valley Conference boys track meet Friday at Cary-Grove High School. 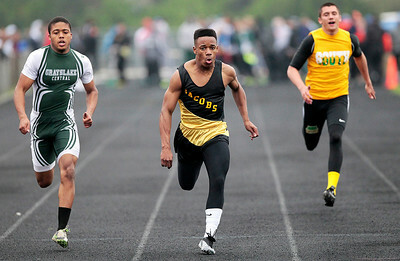 Kyle Grillot - kgrillot@shawmedia.com Jocobs sophomore Walker Josh, Crystal Lake Central senior Isaiah Mosher, and Grayslake North sophomore Titus Booker compete during the men's 100-meter dash finals during the Fox Valley Conference boys track Friday at Cary-Grove High School. 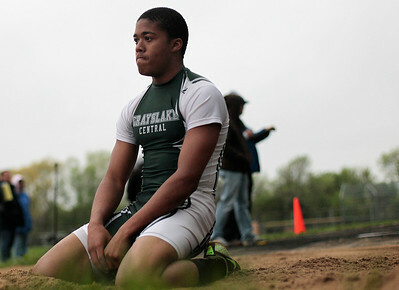 Kyle Grillot - kgrillot@shawmedia.com Grayslake Central junior Kacey Adams takes a moment to himself after competing in the long jump event during the Fox Valley Conference boys track Friday at Cary-Grove High School. 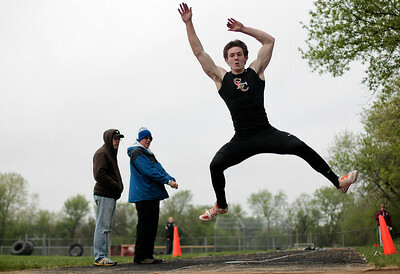 Kyle Grillot - kgrillot@shawmedia.com Crystal Lake Central senior Isaiah Mosher competes in the long jump event during the Fox Valley Conference boys track Friday at Cary-Grove High School. 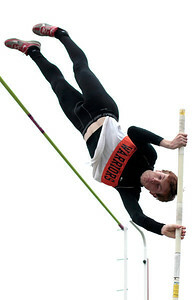 Kyle Grillot - kgrillot@shawmedia.com McHenry Senior Nate Richartz competes in the pole vault event during the Fox Valley Conference boys track Friday at Cary-Grove High School. 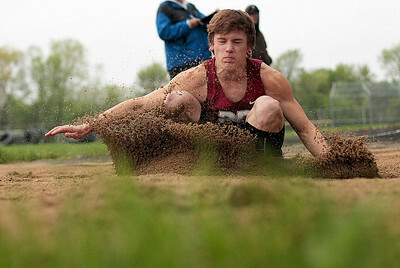 Kyle Grillot - kgrillot@shawmedia.com Prairie Ridge sophomore Brenden Bruhnke lands after competing in the long jump event during the Fox Valley Conference boys track Friday at Cary-Grove High School. 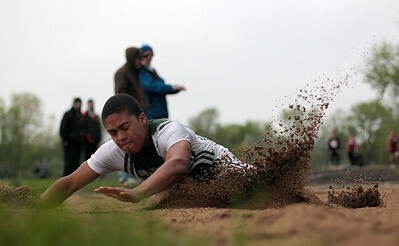 Kyle Grillot - kgrillot@shawmedia.com Grayslake Central junior Kacey Adams lands after competing in the long jump event during the Fox Valley Conference boys track Friday at Cary-Grove High School. 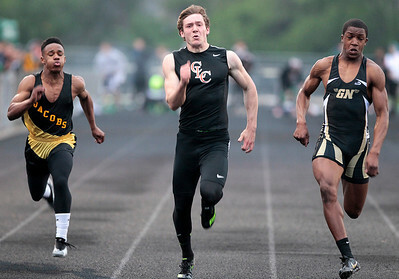 Kyle Grillot - kgrillot@shawmedia.com Crystal Lake Central senior Isaiah Mosher (center) leads the men's 100-meter dash semi-finals during the Fox Valley Conference boys track Friday at Cary-Grove High School. Kyle Grillot - kgrillot@shawmedia.com Jacobs sophomore Walker Josh (center) competes with Grayslake Central junior Kacey Adams (left) and Crystal Lake South senior Zach Balousek during the men's 100-meter dash semi-finals during the Fox Valley Conference boys track Friday at Cary-Grove High School. 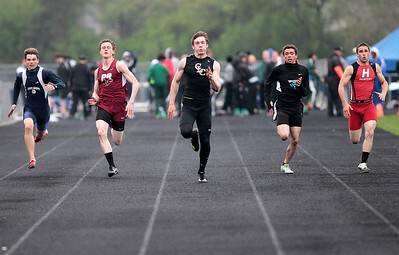 Kyle Grillot - kgrillot@shawmedia.com Grayslake North sophomore Titus Booker, McHenry sophomore Italo Roche and Huntley senior Mike Dollar compete in the men's 100-meter dash semi-finals during the Fox Valley Conference boys track Friday at Cary-Grove High School. 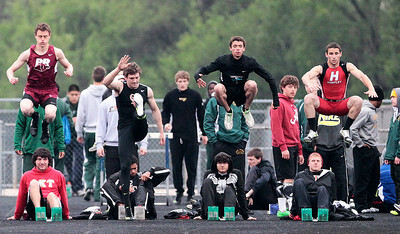 Kyle Grillot - kgrillot@shawmedia.com Competitors prepare themselves for the men's 100-meter dash semi-finals during the Fox Valley Conference boys track Friday at Cary-Grove High School. 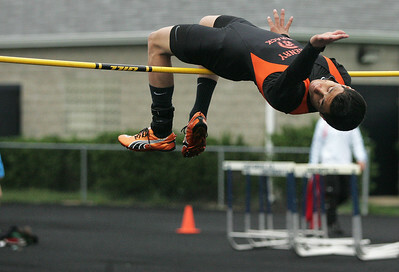 Kyle Grillot - kgrillot@shawmedia.com McHenry senior Gilbert Matias competes in the high jump event during the Fox Valley Conference boys track meet Friday at Cary-Grove High School. 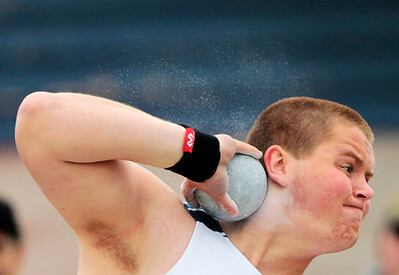 Kyle Grillot - kgrillot@shawmedia.com Cary-Grove sophomore Ricky Hurley competes in the shot put event during the Fox Valley Conference boys track meet Friday at Cary-Grove High School. 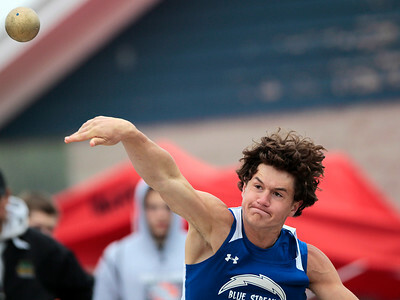 Kyle Grillot - kgrillot@shawmedia.com Woodstock senior Phil Krueger competes in the shot put event during the Fox Valley Conference boys track meet Friday at Cary-Grove High School. 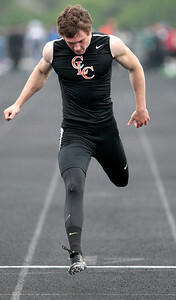 Kyle Grillot - kgrillot@shawmedia.com Crystal Lake Central senior Isaiah Mosher crosses the finish line as he wins the the men's 100-meter dash semi-finals during the Fox Valley Conference boys track Friday at Cary-Grove High School. McHenry Senior Nate Richartz competes in the pole vault event during the Fox Valley Conference boys track Friday at Cary-Grove High School.